Since joining Bay State PT, Sharon has had successful relationships with her patients who present with various orthopedic injuries. She enjoys working with patients with hip, knee, and ankle injuries and incorporates yoga philosophy as well as exercise based programs to improve patient function. She has experience working with patients after joint replacement, low back pain and shoulder injuries. Salem’s diverse population gives her an opportunity to grow her intermediate Spanish speaking skills. Sharon’s hope for each patient is that they will achieve their optimal health following treatment to return to an active and healthy lifestyle. Sharon attended Northeastern University and graduated with her Bachelors of Rehabilitation Science in 2009 followed by her Doctorate of Physical Therapy in 2010. She is married and welcomed a son in November 2016. In her free time, she enjoys practicing yoga, running half marathons, spending time outside in nature, and baking at home. 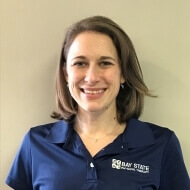 Sharon Godbout joined Bay State Salem in January 2016 following five years of clinical work in the acute care setting at Beth Israel Deaconess Medical Center (BIDMC) in Boston. At BIDMC, she gained valuable experience working with patients following cardiac surgery, orthopedic trauma, and neurological disorders including stroke and aneurysm. After moving to the North Shore in January 2015, she made the decision to transition to outpatient physical therapy to return to a community oriented setting while growing her skills in manual therapy.